I am sharing another Tessa Kiros recipe with you today. Yes, I want to be Tessa when I grow up! I absolutely adore her cooking and she has been a source of inspiration for years. I love the simplicity of the recipe and it is pleasing enough to serve when you have guests. Try to purchase chicken cutlets from your butcher. If not available you may buy two chicken breasts and thinly slice them horizontally into two or three slices. Heat half the oil with the garlic in a large nonstick skillet. Add the tomatoes with a little salt, and cook over high heat until they are just starting to pucker. Lift them out onto a plate. Set aside. Add remaining oil to the pan. Lightly dust the chicken with flour on both sides. Place the chicken into the pan, add the sage and cook over medium high heat until the underside is golden. Turn over and season with salt. Put the garlic cloves on top of the chicken if they look like they are going to burn. Cook until the new underside is golden brown. Turn the chicken again and season with salt. Add the wine, put the tomatoes on top of the chicken and toss in the capers and parsley. Let it bubble up and evaporate a little, then cover and leave for a couple of minutes before serving. My kind of recipe, all the way! simple and definitely delicious with the addition of capers, they always brighten up a dish, I LOVE them! I love capers too, especially the larger size. We have this chicken recipe often and never grow tired of it. It is wonderful. I love Tessa Kiros recipies! This looks really good. Seana – I love capers and white wine in any dish. The chicken looks PERFECTLY prepared. Oh my. Can’t wait to try it! What a lovely addition of the sage. :-) This would also be nice prepared with salmon or a white fish. A versatile recipe. Beautiful photo, too. always love herbs spiced chicken! This is perfect comfort food. Sage, white wine and capers elevates it to something more. What wonderful flavors without being too complicated. Thanks for sharing! It really is a simple chicken recipe and so wonderful. I give full credit to Tessa Kiros…a master in Mediterranean comfort food! Thank you Amanda. I’d forgotten about Tessa. I have one of her earlier books Apples For Jam on my bookshelf. This looks delicious. She’s so talented and inspiring. Thanks for reminding me, My bookshelf has been sadly neglected of late. Time to rediscover my old ‘friends’. this is a great combination – tomatoes and capers. I bet the cutlets sure taste good with that sauce. Such a great combination of flavors, very Mediterranean. The colors are beautiful and the dish sounds delicious. Thank you. I was just reading your Whipped Chocolate Caramel Ganache post (very late, I know…I’ve been slammed at work) and I am so intrigued by this recipe! I am not a fan of icing, however, this appears to be good enough to eat by the spoonfuls! Thank you for always leaving such nice comments Suzanne. I just love Tess Kiros recipes and you have done her proud! This chicken dish looks delicious as always Seana! love the simplicity! (seems to be a theme here ;-) ) And anytime you can toss capers into a chicken dish, I’m there. Definitely a way to fancy up ho-hum chicken breasts. Yes, her recipes are so wonderful. I have been inspired by her cooking for years and I owe much of what I know to her and her wonderful cookbooks. I think you have a right to whine about such a problem! I would too. Seems like herbs have really become a staple in cooking anymore. I remember my mom never really used many herbs in her cooking. And if she did it came out of a little jar. Thank you Prudy. :) We just love this chicken dinner. And using the thinner slices of chicken really makes a difference. So tender and perfectly flavored. Talk soon! Yum! I love Tessa too & this looks like a divinely simple recipe. It might very well turn into dinner tonight in fact! Yes, do. She’s fabulous. Was nice visiting your blog yesterday. Although I can not translate I certainly love your photographs, and you are an artist plating your meals. Gorgeous. :) Nice to hear from you. I checked out Tessa Kiros, you’re right! Wow, she had a recipe for cranberry sorbet, must try that, do you have any experience with that? No, never heard of that one! Seriously, everything Tessa makes is incredible. Cranberry sorbet sounds amazing though. I love capers, I’ve always thought of them as a fish compliment, but I can see how it would be a tasty addition to chicken as well! It’s true. Capers generally are served with fish! I never thought about that. I also have a pasta recipe with capers and tomatoes which is delicious! I like the combination of sages and capers…a nice sounding recipe. Lovely recipe without too much fuss. I can only guess it tastes as good as it looks and it looks pretty good. Thank you. Yes, it is very simple to put together and tastes wonderful! Looks delicious! I’m sure the capers gave it the perfect finishing touch. So lovely colors on a plate! :) I love capers with any meat. You’re such a lovely blogger! Honestly one of the nicest people I’ve met on the network. Anyway, this just looks great…I’m a sucker for acidity and both the tomatoes and capers are making me crave this right now (oops, I should stop looking at food blogs past midnight). You are too kind yourself Irina! :) I don’t see how you can look at food blogs past midnight! I could never keep my eyes open. I truly love acidic foods too, can not get enough tomato based sauces and soups. Sounds delish, I will give this one a try! Thank you. You certainly can make your own cutlets by horizontally slicing the chicken breast into two or three thin slices. It turns out so tender and moist. Really loved your Hugo story today…. 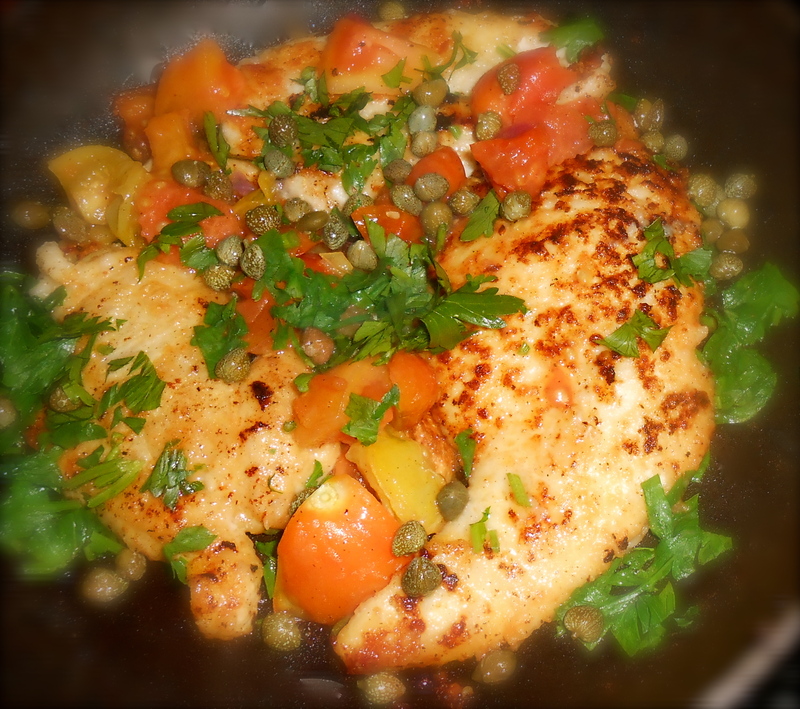 You are currently reading chicken cutlets with tomatoes and capers at COTTAGE GROVE HOUSE.